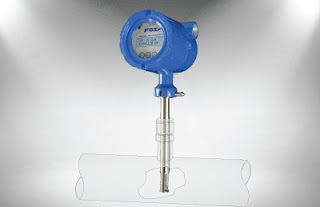 Fox Thermal Instruments, manufacturer of thermal technology based mass flow instruments for industrial process measurement, has introduced a new more advanced product providing the accuracy and reliability users expect from Fox, along with some new features extending the ease of use and applicability of the instrument. The basic operation involves measuring flow in relation to its heat dissipating effect on a temperature sensor. Higher mass flow produces a higher rate of heat transfer. The mass flow measurement instruments are very popular for several reasons. They have no moving parts, have a fairly unobstructed flow path, are accurate over a wide range of flow rates, calculate mass flow rather than volume, measure flow in large or small piping systems, and do not need temperature or pressure compensation. While most thermal flow meters are used to measure flowing gas, some also measure flowing liquids. The new model FT4A incorporates the latest feature updates and technology advancements. More information can be found in the datasheet provided below. Share your gas flow measurement challenges with instrumentation specialists. Combine your own process experience and knowledge with their product application expertise to develop effective solutions. New Thermal Mass Flow Meter From Fox Instruments from Classic Controls, Inc.